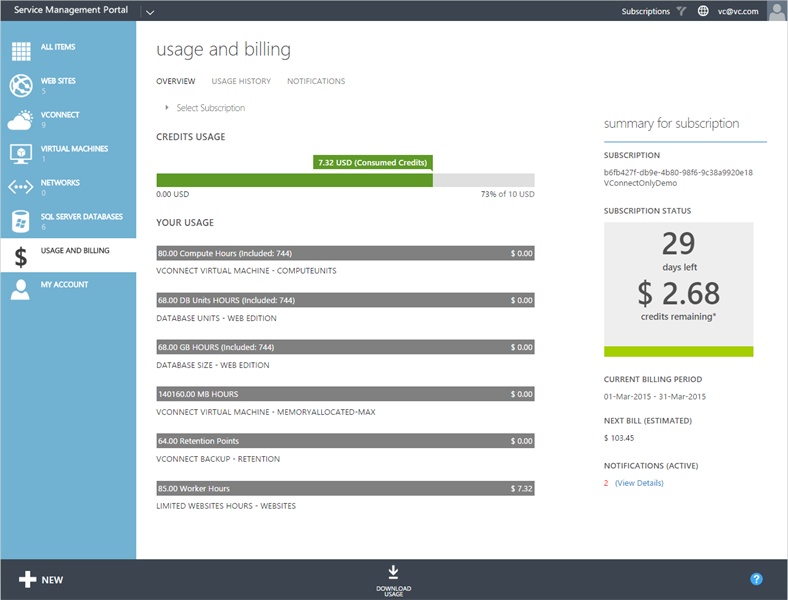 We are very excited to announce the release of Cloud Assert’s Usage and Billing Solution for Windows Azure Pack ! Built for enterprises and service providers to offer metered cloud offerings on Windows Azure Pack. Enables multiple usage scenarios such as pure consumption based pay-as-you-go billing, bundled offers with advance payments and any combination of these models. 100+ usage resource metrics are available out of the box. Each one of this metered resource can be configured with an individual price rate. See up to date information on your customer's total usage consumption, current or historical, with breakdown of each resource they have consumed, and monitor them for your capacity planning. Your customers can even set consumption alerts and be notified according to their usage preferences. You can now provide better usage visibility to your end users and with these unique features you are guaranteed to drive higher customer satisfaction. Automate end-to-end customer signup, order processing and monthly utility based invoicing with our out-of-box support for WHMCS. Get a leap ahead with your Windows Azure Pack cloud offering today ! Register Here for a Free trial ! Overview of current usage for Tenant Subscription. Note: More screenshots in below gallery, click on one of the images below to view them. Awesome article! Thanks for releasing this. I am getting the better and making the helpful services and educational making services for the custom essay topics. This writing essays blog has been developing and preparing the services and making quality writing methods. The details we have got for announcing different updates to use for billing. Then we will manage everything to create many announcements. So, we all happy to gather interesting values. It is the place to use the quickbooks help support number on our site without download and signing up. Azure AD offers a comparable list of capabilities to most IDaaS sellers with regards to getting clients and gatherings set up to dole out and give access to SaaS applications. This is helpful. Windows purplish blue pack is a free downloadable programming with a lot of sky blue advances to oversee on-premise server farm. It gives an approach to execute sky blue administrations on your condition as a private or facilitated cloud. i have appreciated this info. buddies if you are not to able in fix connections to Bluetooth audios device and wirelesses displays in window 10 system, follow this link and manage all the related settings in without any error. Cloud computing is an incontestable reality. Its use and applications are so many and so varied for professionals, individuals and companies of all kinds that it is not surprising the unstoppable growth of software and other solutions hitherto unpublished in this environment, including billing and accounting programs for SMEs and freelancers.